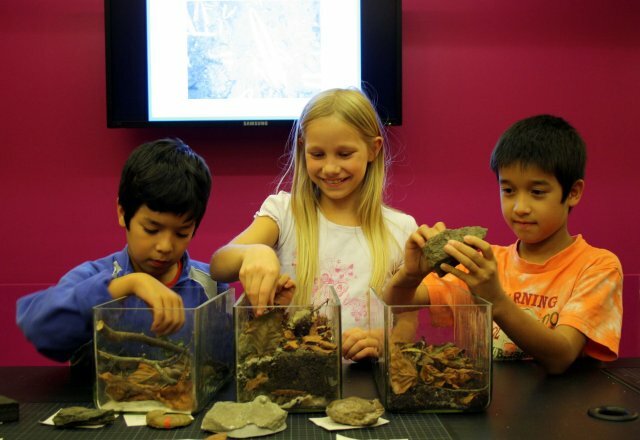 This time, the programme during autumn break will be about fossils, bones and shellfishes. 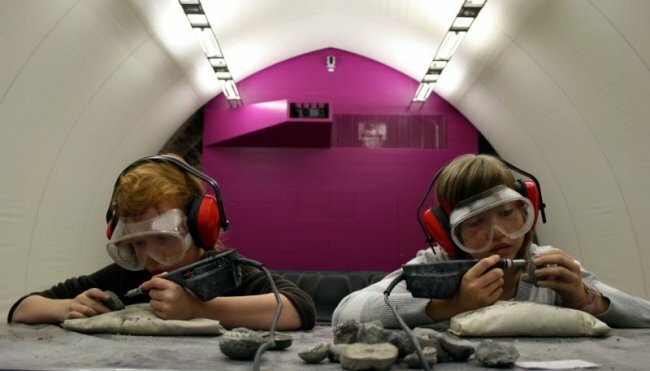 From 2nd to 17th of October 2010, girls and boys will get interesting facts on the development of fossils and will be able to experiment with them. What do I have to do for finding nice and multicoloured autumnal leaves as fossil imprints? How does wood become a stone? By a chronological table, pupils will be able to check their knowledge and will classify real fossils. So, they will learn easily when plants and animals came up on Earth. When did dinosaurs exist? How did birds learn to fly? Fossils do not only look well but are also practically and industrially used-children will learn these facts too. By microfossils, which are found in drill cores as for instance, oil springs can be found. Looking at these tiny exhibits under the microscopes of the ‘Forschungsreise’ (expedition) will be fascinating. There will be a special offer during autumn break in terra mineralia as well: Prepare your own fossil! Five electric gouges will be available. 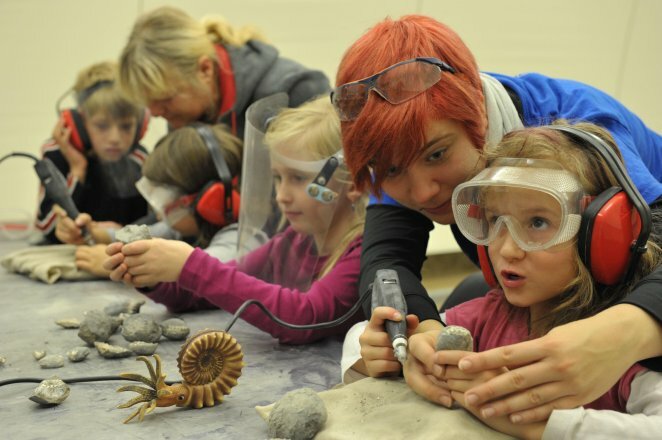 Participants will get ammonite out of rock under the guidance of students of the TU Bergakademie Freiberg. Those ammonites, which are also called Pleuroceras Spinatum, came up during the Jurassic period and are about 190 million years old. These ammonites were discovered in Nedensdorf near Bad Staffelstein. People who will look around attentively afterwards, will also find three special fossils, which belong to the Pohl-Ströher-Mineral-Foundation, namely an opalised bone, mussels and calcite as well as a piece of wood surrounded by crystals. You don’t have to go away in order to have summer, sun and sand. During summer holidays, terra mineralia will present sands from beaches worldwide. Last year, visitors brought samples from North Sea, Baltic Sea, Miami Beach and Kenya as souvenir. From 13th of July to 8th of August 2010, visitors will be able to marvel at the exhibition’s variety in Freudenstein Castle always on Tuesday, Wednesday, Thursday and Saturday. 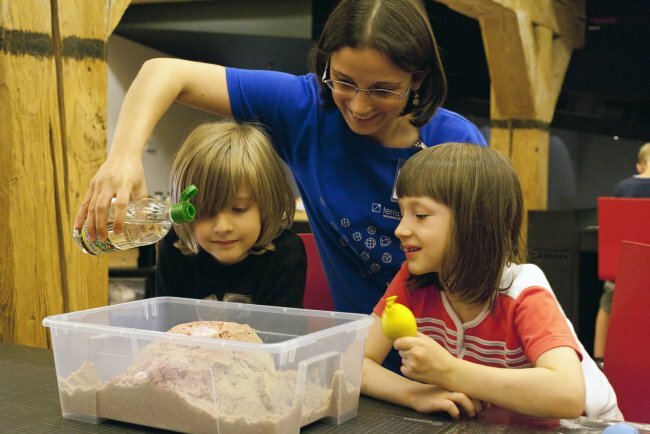 Children can examine sand carefully at the ‘Forschungsreise’(expedition) of terra mineralia. By exciting experiments they will get answers to some questions. Which types of sands do exist? Where do samples come from? Apart from sand castles, what is made out of sand? How does sand emerge? Why does sand ‘move’? Does sandstone actually consist of sand? These questions will be answered during the week from 13th of July 2010. During the second week (from 20th of July), firestones will be significant, which are popular souvenirs from holidays at Baltic Sea. Are they special? How do they develop? How are they used? Is it actually possible to make fire with flints? All these questions will be answered. If you fuse sand and then cool down it promptly, glass develops. Students of the TU Bergakademie Freiberg are working on an experiment regarding self - made glass. Is it actually working? This will be demonstrated from 27th - 30th of July 2010. Finally, the best experiments of the programme on summer holidays will be presented again during the last week. Apposite to different experiments around sand and glass, terra mineralia will offer crafting once more. So, children will not have to go home empty-handed. 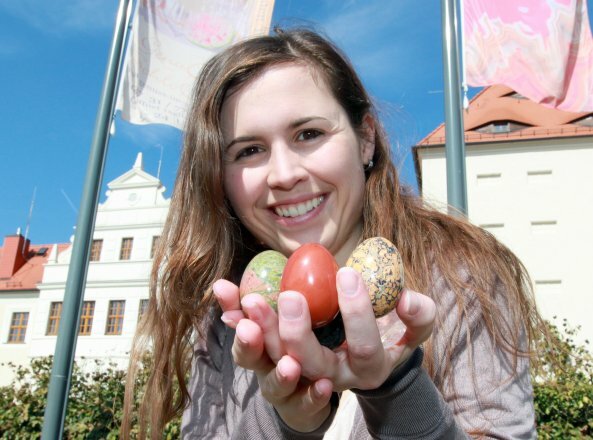 In addition to the Easter Holidays, there will be exciting and colourful experiments during Easter holidays at the ‘Forschungsreise’ (expedition). Such experiments demonstrate an unusual perspective into the heart of a mineral. 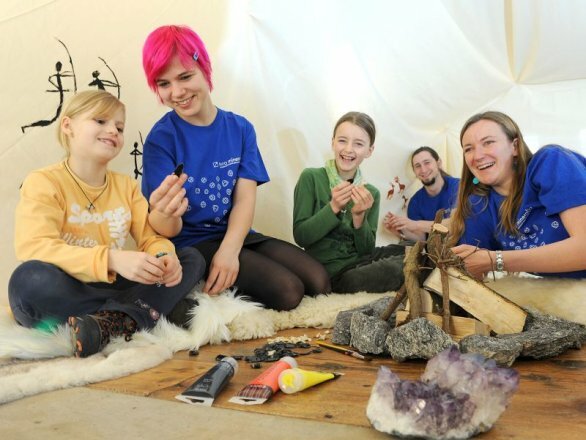 Apposite to Easter, children will make colours of minerals out of green malachite, blue azurite or red hematite. Further, mortars and acrylic binder will be used. After that, the Easter egg will be painted by self – made colours. In the winter holidays from 6 till 21 February, children and youths can get to the bottom of questions surrounding the subject of ice and snow. 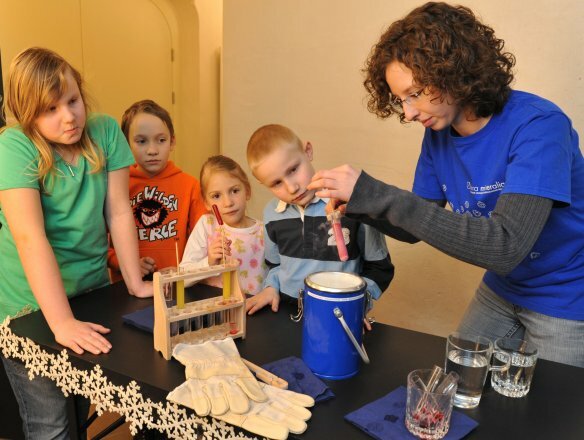 Many experiments and lots of information will be awaiting the young visitors to Freudenstein Castle in Freiberg every day between 9 am and 4 pm. They will have the opportunity to watch ice crystals growing and not only that! They will also be able to make their own fruit sorbet using liquid nitrogen and grow their own frost flowers. Which flower only grows in winter? The frost flower of course! We all know that the symmetrical filigree ice patterns that grow on frosty window panes are not plants. But are they made up of a mineral? What better place to investigate the matter than at terra mineralia, the large private mineral collection of the TU Mining Academy in Freiberg? “In the winter holidays, we will be offering a very special programme for children and youths,” explains Christina Seifert who is responsible for events at terra mineralia. In the foyer and the “Journey of Discovery”, we have built up stands where experiments that are suitable for children will be set up. “As homage to the time of year, we want to show, using ice and snow, how crystals form and how they grow.” For this purpose, equipment such as modern microscopes will be available for the young visitors, with which they can examine the tiny, frozen works of art in fine detail. The young visitors can also dig up information on other questions they would like answers to. For instance, why does ice float on water instead of going under? And how can fruit juice be turned into sorbet as quick as a wink? 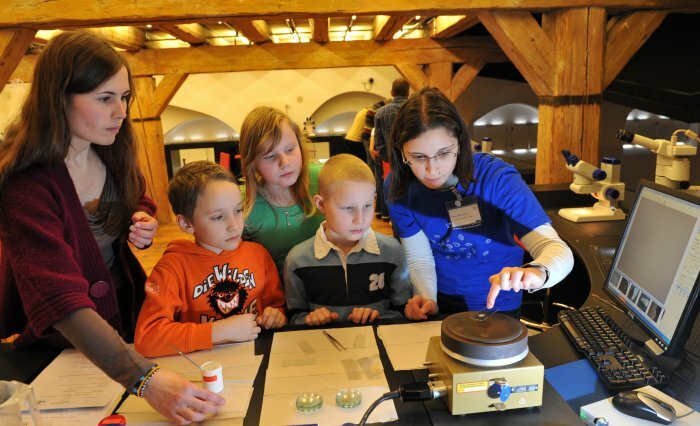 At all the stands, students of the TU Mining Academy, Freiberg will be standing by to explain to the young scientists, what needs to be done and to help them with the experiments.